Forms (invoices and statements, etc.) have different printing options to other printouts. This is because they are graphical (as opposed to textual) in nature—it is in fact this graphical nature which prevents customisable forms (i.e. any form except the “Plain” ones) from being emailed except as a pdf attachment. 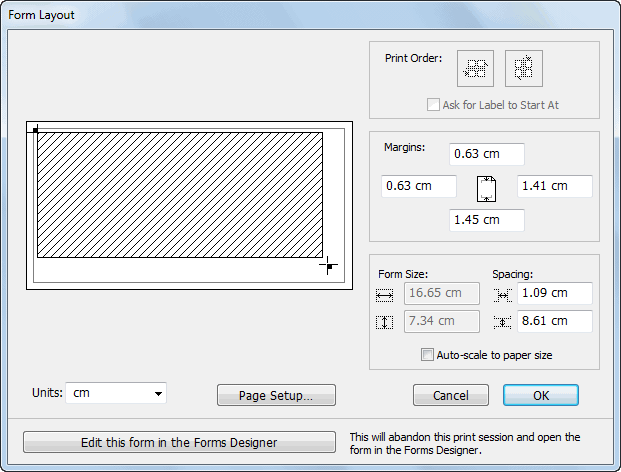 The Print Forms settings window will be displayed. A thumbnail preview of the form (if available) will be displayed to the right of the Use Form pop-up menu. You only need to do this the first time a form is being printed, to ensure it is correctly positioned for your printer. Your printer’s standard printer Page Setup dialog will open. Use this to choose the paper size (e.g. A4) and orientation for the form. Position the form within the available margins for the paper you have selected by sliding the shaded rectangle. If there is no shaded rectangle, it is because the paper size you have selected is too small for the form you are using.